W 2 Wn Müllerhof, Alderney. Les Iles Anglo-Normandes. 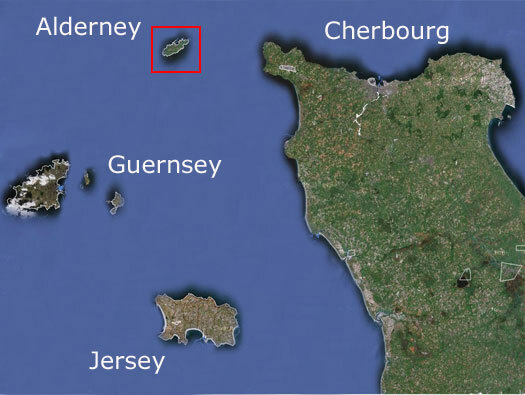 Alderney a small island off the coast of the Cherbourg Peninsular one of the Channel Islands and a Crown dependency. 3miles x 1.5miles. In June 1940 its entire population was removed and sent to either the other Channel islands or to Britain (most ended up in Glasgow). Then the German occupation forces arrived on the 2nd July. 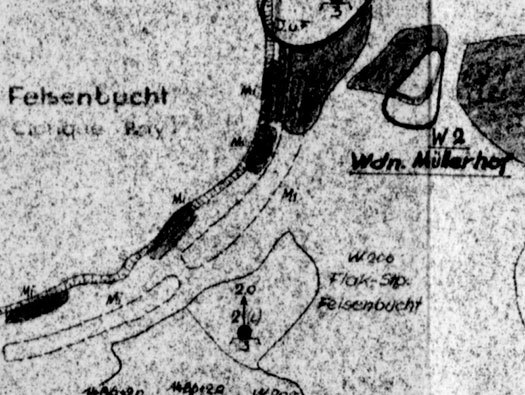 Hitler thinking that the British would attempt at recapturing, ordered it to become a Festung and later combined into the Atlantikwall. We did not visit the right side but we walked the path to the left following the red arrows. 1 x 60cm Searchlight bunker. 3 x Vf personel bunkers. 1 x 5cm Automatic Mortar bunker. R633 5cm Automatic Mortar bunker. MP5 Türkenburg with its R670 down by the beach and the curtain wall running up the hill to the main Fort Tourgis. To its right is the searchlight possition. 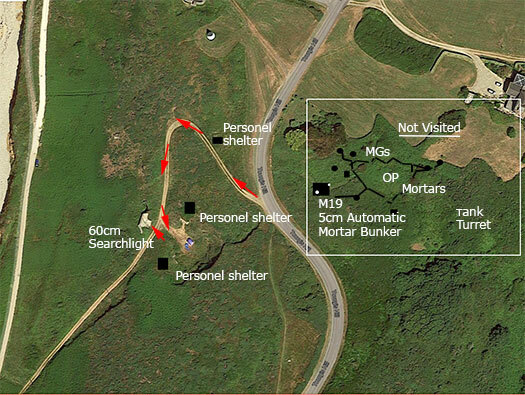 The searchlight bunker of the hill with two bunkers set into a small quarry (red arrow). 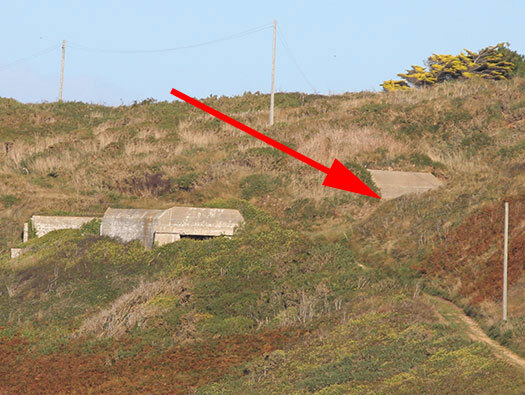 Alderney, W 2 Wn Müllerhof Vf bunker. Now in the quarry the first Vf bunker. Vf bunker passage way with a niche possibly for communications?? Vf bunker looking into the bunker with a steel sheet roof covered over with concrete..
Another niche still with all its wood intact. 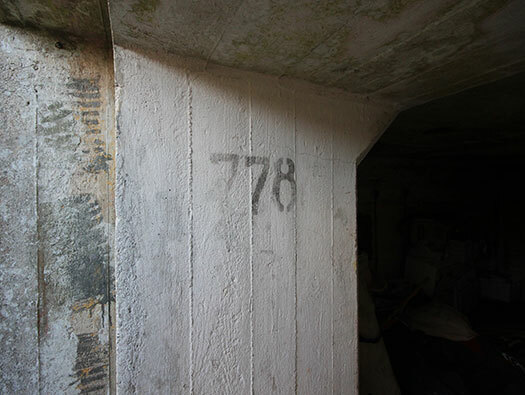 Second Vf bunker entrance showing that there should have been a heavy door and frame set into the concrete..
No.778 nice to see its number still in place. Second Vf bunker inside and notice a different style of roof. Two niches on the inner wall. Alderney, W 2 Wn Müllerhof Quarry. Looking out of the quarry. The view over the top of the searchlight bunker at Fort Clonque W 3 Wn Steinfeste. 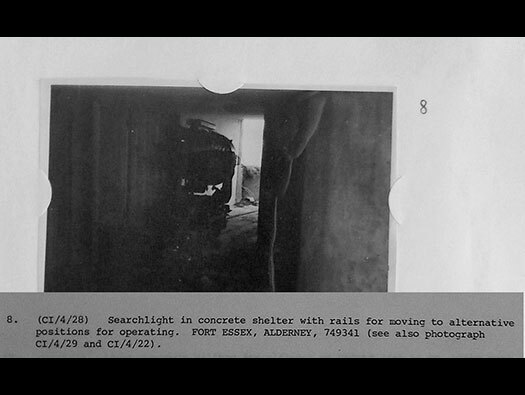 Alderney, W 2 Wn Müllerhof Searchlight bunker. Searchlight bunker entrance, a set of steps down into a passage..
One of the searchlights near Fort Essex just like this one. Inside looking right with the searchlight storage roomm on the right. The limited view out on the right due to undergrowth. looking back into the centre. Searchlight storage & maintenance area. Plan of a 150cm searchlight. Storage niches with the wood still in place. 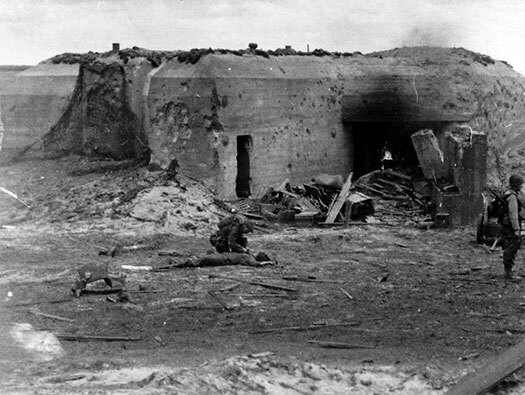 Alderney, W 2 Wn Müllerhof M19 Mortar Bunker R633. An M19 mortar could be fired automatically and adjustable speeds and also manually. Either way it was a very effective weapon. The range here would have allowed a 'stream' or 'shower' of mortar bombs to fall on a predetermined map reference laid down in the a fire plan. The forward observer would call the bunker either on a field telephone or by radio and give them the target. Usually in these cases a code name and that was an area the enemy would be attacking. There would be several coded areas around the Wn defence and usually say girls names or local towns. Anything memorable to the soldiers fighting here. Plan of the R663 at StP09 Ravenoville, Normandy. M19 mortar steel turret plan. M19 mortar steel turret 428P01.